The new version of the BBC iPlayer is to be rolled out over the coming week across a multitude of devices, plus Xbox One by the end of the year, as the broadcaster confirms it is retiring its older "bigscreen" iPlayer. While an exact list of models was not provided, the iPlayer help pages contains further information about models compatible with the catch-up service. As a new version of iPlayer is rolled out, another one is to close: the bigscreen version is only used by 0.1% of users, according to the BBC, and so from next month, devices that previously used the bigscreen iPlayer (pictured) will no longer be able to access it. 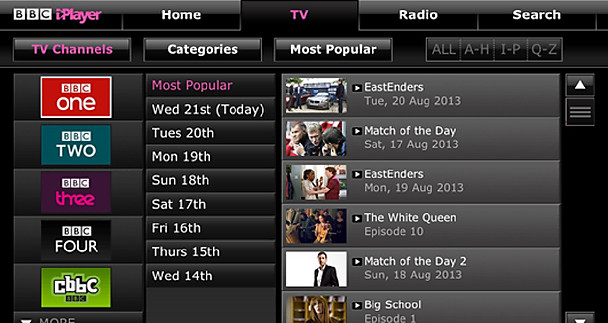 The similar looking iPlayer for non-Freetime Freesat boxes will not be withdrawn, according to Marcus Parnwell. Meanwhile, the latest version of iPlayer is being prepared for roll-out on YouView, Virgin Media TiVo and BT Vision; dates to be confirmed. For Xbox One users, it has been confirmed that the new iPlayer is to be launched on the console "by the end of this year." 4 years since purchasing a "Smart" Sony Blu-Ray player and its use for what I purchased it is nearly pointless now. If I bought a Smart player or TV, and in just less than 10 years its most basic smart services and functions were withdrawn, I would feel that I had been mis-sold the equipment. If over 15 years, then it may be expectable. But one does expect a piece of equipment such as this to last for 10 years at least. But, within 4 years of purchase - the basic Catch-Up TV's functions are withdrawn (except for 5 on Demand in SD). The Sony Blu-Ray player had a great iPlayer, and other good Catch-Up TV. This was the real reason I bought the machine. It seems though other people are being much more shafted than even this. Sony players from 2011 are now defunct for most basic Catch-Up TV, less than 3 years old. Also, Panasonic devices from 2012, many just less than 2 years after they were purchased - no IPlayer possible there. These items were bought on the understanding that the services sold with them - for example Sony Bravia TV - were going to be services which stayed, not which dropped out the basic functions of Catch-Up TV within less than 2 or 3 years of purchase. The BBC and the major brands can easily have made updated apps to go with the technology of these machines. They're not out of date. Mine is a great use of a Java machine of the last few years for streaming high definition video without hitches. What is wrong with making another Java app. As for the BBC, 0.1% of watchers used these apps - I simply do not believe them. There were a lot of machines bought, TVs, blu-ray players and Set-Top boxes. One has to wonder if the corporation can get away with Savile, Rolf Harris and its lies surrounding that and many related affairs, if it is happy to demonstrate it can say anything it likes.